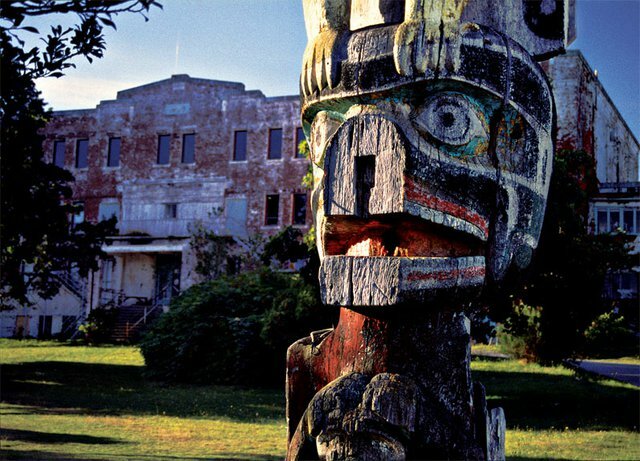 Demolition of St Michael’s Residential School in Alert Bay, BC, begins on Feb 18, 2015. It will take a month for the demolition to be completed. 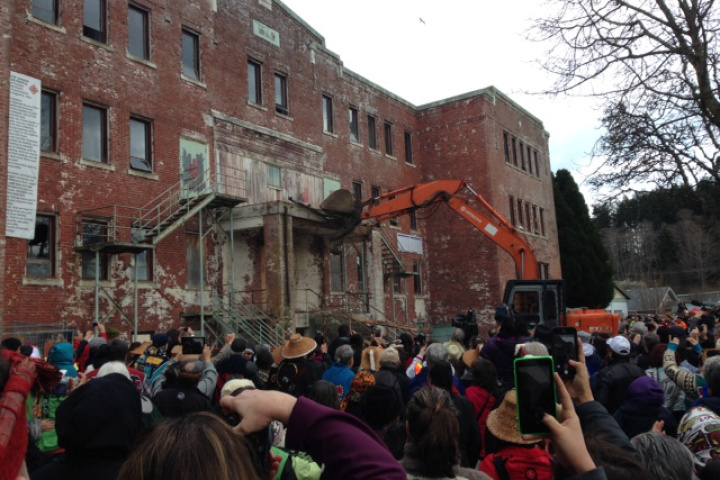 ALERT BAY – Hundreds of residential school survivors and their supporters gathered Wednesday in Alert Bay for the demolition of the decrepit, looming St. Michael’s Indian Residential School building. “It was important for me to go because I wanted to see how I would feel,” Stanley Hunt said. He recalled the day, Sept. 4, 1944, his father took him to the school. He was five years old. A marching band comprised of students leaves St Michael’s Residential School. “Because I was a little guy in awe of the building, I shared that in our language,” said the 77-year-old fisherman. One of the staff slapped him on the head and told him he couldn’t speak his language. This set the tone for 10 traumatic years at the school and 70 years of pain, Hunt said. 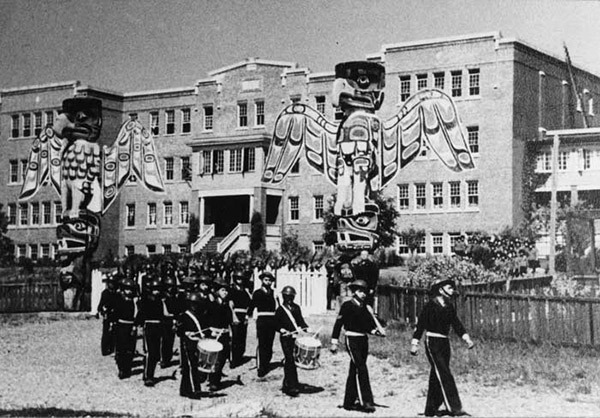 The residential school, off northern Vancouver Island, was operated by the Anglican Church from 1929 until it closed in 1974. Each year, hundreds of children were forced from their homes by a local Indian agent to attend the school. They were among more than 150,000 aboriginal children across Canada forced into government-funded and church-run schools from the 1800s to the 1990s. Although it was later used by the Namgis band, the building remained a symbol of its dark past and became too costly to maintain. Before the demolition, a ceremony of prayers, songs and speeches honoured residential school survivors and those who have died. Participants were invited to release anger or pain by throwing stones at the brick building, which bore an apology sign from the Anglican Church. A decayed totem pole outside St Michael’s Residential School. Hunt said as he stood among the emotional crowd, he felt mostly numb. “Put a college there. Train our young people in their own community. We’re going to need that,” Hunt said. The demolition ceremony was followed by healing and celebration rituals and a gathering at Alert Bay’s big house with First Nations leaders, Anglican clergy and politicians. Survivors and their families travelled from across the Island and the mainland to attend. Others held ceremonies in their own communities. Eric Joseph’s father “Wolkine” Patrick Arthur Joseph was forced to attend the residential school at age seven or eight. “Prior to being taken, he was raised by his grandmother who was a medicine woman who lived entirely from the resources of our land and water,” said Joseph, who described his father’s rich early life, learning local languages, harvesting and hunting by canoe. “When he was taken from this freedom, he vowed at his young age to never allow them to break or change who he was, and he would always resist,” said Joseph, a hereditary and former elected chief who now lives in Port Hardy. He described his father being left out on a fire escape overnight or put in a chamber called the “monkey cage,” used to punish children. “It’s unimaginable. … I have a daughter that age,” he said, choking up. Later he became a skilled welder and helped raise a family of five, but he still struggled with the past. Before his death in 2009, he was awarded $200,000 in a reconciliation settlement for the abuse he suffered. Joseph said it gave his father some closure. “It’s important for our kids to know the whole history. It needs to be recognized and brought into the schools, because there are still social issues that need to be resolved,” he said, noting many social systems and policies are still in place that prevent reconciliation and justice for aboriginal people. A film crew attended the event for a documentary about Carey Newman’s Witness Blanket Project. The Victoria-based master carver collected stories and items from residential schools across Canada and wove them into an art installation that is on a seven-year national tour. The centrepiece of the blanket is a door from St. Michael’s Indian Residential School. Posted on February 19, 2015, in Colonization and tagged Alert Bay, Kwakwaka'wakw, Namgis, Residential School demolition, Residential Schools, St Michael's Residential School, St. Michael’s Indian Residential School. Bookmark the permalink. 1 Comment. Reblogged this on Raising Cain.